If you own a commercial property or are a small business owner looking to spice up the interior of your store/office, have you considered incorporating concrete into its interior design? From concrete floors to countertops, and a number of other surfaces, concrete can provide any business with the look and appeal they’ve been seeking. Whether your goal is to create elegant ambiance within your store or to increase the value of your commercial property, concrete could be the material that’s right for the job. Almost every store has an area where customers can ‘check out’ and purchase their items. Why not use a sleek concrete countertop for the project? In addition to this, every business has a floor. Instead of constantly vacuuming or deep cleaning carpets or investing a great deal of money in another material, consider opting for a concrete floor installation. Concrete is a material with a great deal of longevity. While plain concrete doesn’t have a glamorous look, it can be installed to mimic a number of different materials. Concrete can be made to look like a number of different materials such as wood, tile, stone, and more. This is done with a concrete overlay. An overlay is simply an additional layer of concrete that is poured on top of the base of a surface. It is done primarily for aesthetic purposes, although it can also be done to repair and reinforce older surfaces and structures. Concrete can achieve a number of glamorous looks for a fraction of the cost of certain other materials. 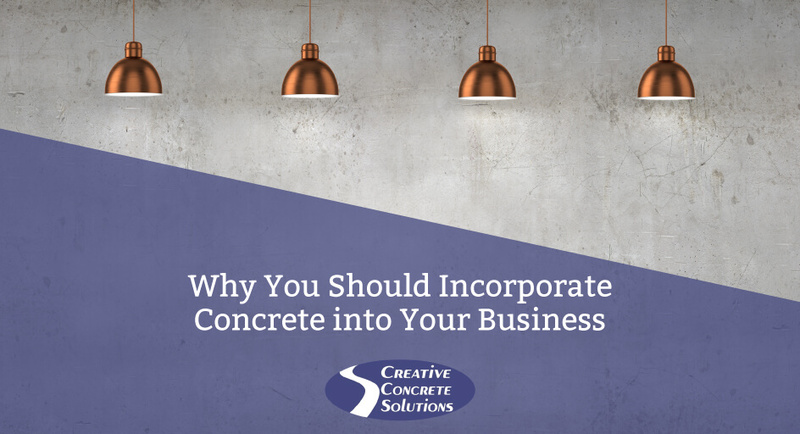 With so many flooring and countertop options available, why should your business choose to implement concrete? We’ll give you 3 solid reasons (pun intended). 1. Concrete is incredibly sturdy. If you operate a busy company, you’ll have a great number of customers in and out of your store on a daily basis. Concrete will be able to stand the wear and tear of daily shoppers, employees, and more. 2. Concrete offers an infinite number of designs! From different colors to textures, and the other flooring materials concrete can mimic, the possibilities provided by concrete seem endless. With concrete overlays and stamping, you should be able to find the perfect appearance for your business by choosing concrete. 3. If you’re interested in selling your commercial property, concrete additions can increase the overall value of your building. Consider using concrete for the properties’ floors, countertops, and more in order to increase the overall value of your building. In many instances, concrete will allow you to sell your property for more than it was initially quoted for. With the many benefits provided by concrete, what are you waiting for? Call the Creative Concrete Solutions professionals today at 615-691-6613 to get started on adding concrete to your commercial property or business.